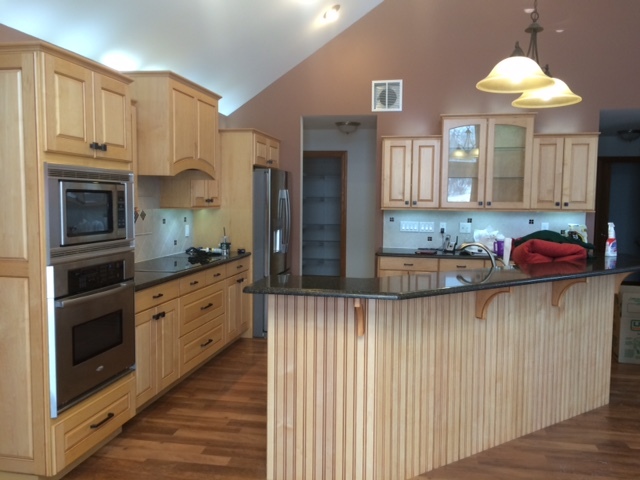 White maple isn’t actually a wood species, it is hand selected lumber from the sapwood portion of maple logs. You pay a premium for it and the boards aren’t always as wide as we would like so a lot of glued blanks are used for raised panels and wide slab drawer fronts. As long as you keep the wood stain fairly light white maple will stain fairly uniformly but the same twisted and interlocked grain is present. 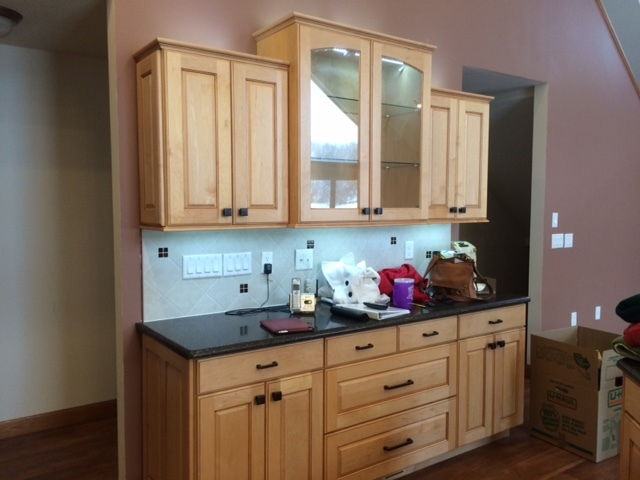 Couple that with a subdued solid surface countertop and you have a clean, modern looking set of kitchen cabinets built by an Oklahoma cabinet maker, not a Chinese laborer. 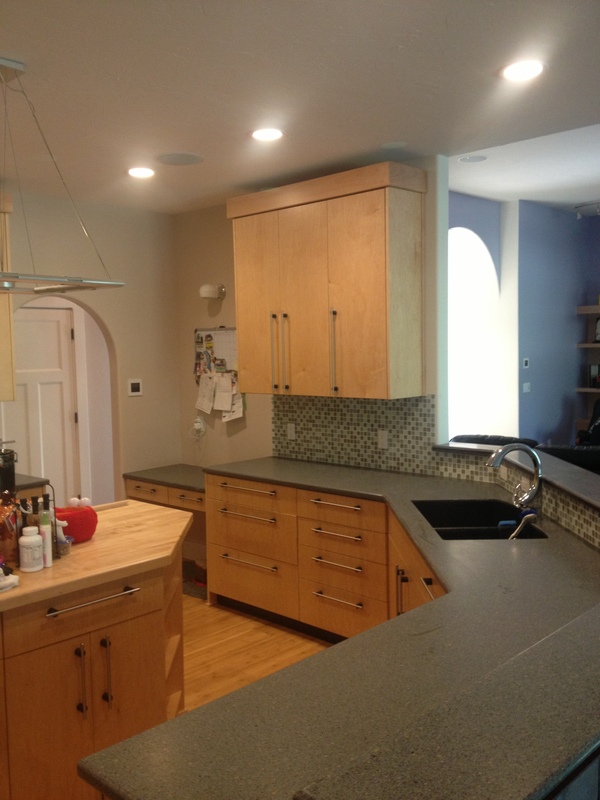 A lot of Oklahoma City cabinet makers hate making modern and contemporary cabinets as near perfection is required and that is difficult and sometimes expensive to achieve. On an old fashioned face frame cabinet the doors and drawers are so far apart that out of square doors and drawer fronts simply aren’t noticed as they are so far a part. You can’t use unskilled laborers or illegal immigrants to build this quality of work. A man that has grown up in a shack in a town with dirt roads has no idea of the expectations of a sophisticated American customer. Even the average American working class employee has problems wrapping their mind around the need for excellence when making modern cabinets. Even the few Oklahoma cabinet shops still around do not hire cabinetmakers, they hire laborers and break the work up into small stages and train on only that part of the job. This was Tara’s kitchen out in Shawnee. Probably one of the most OCD customers I’ve ran into and that is a compliment because she was up front about her requirements and the end product made her very happy. Espresso finish is usually a very fragile multi layer finish and this one is no different. You have to start off with a wood that has lots of grain and is dark to start with, then if there is any red in it like Sapele has you hit it with a green dye stain to knock the red down, turning the wood dark brown. From that point you have to use toner coats, tinted sealer and tinted top coat to accomplish the final finish using many thin coats. The problem is that when you spray something like a door the spray pattern has shadows, just like sunlight would leave a shadow on an undercut surface during certain times of the day. So you have to go around all sides of a door or part, spraying the edge and the undercut part, spinning the door 90 degrees and repeating till all four sides are done, then spraying the center. And some portions will get more coats than others and will wind up darker… So super light coats, many passes through the spray booth with time between coats for curing, and you will get there. This job was a challenge but in the end Tara wrote an awesome review on Yelp, which Yelp promptly hide because Tara had only written one review according to their first explanation. Later Yelp will approach the business and ask for advertising to un-hide the reviews….literally holding companies hostage until they start paying. But I copied and pasted the review into our review section anyway and when Yelp called back in November of 2016 I refused to do business with them as they have an awful online reputation. 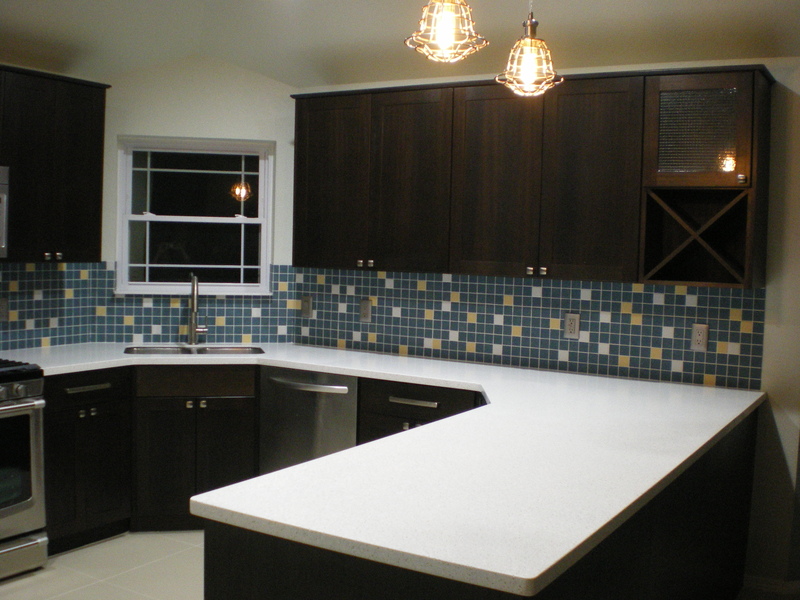 The gorgeous but simple solid surface countertop allows the nearly perfect cabinets be the star of the show and the customer added color in the backsplash, something that wouldn’t break the bank if you ever tired of those colors. 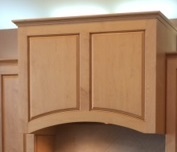 The average Oklahoma City cabinet makers is going to shriek and run for the door when a customer brings in a job like this one. He hires laborers, not skilled cabinet makers, he can see this job going south quickly. 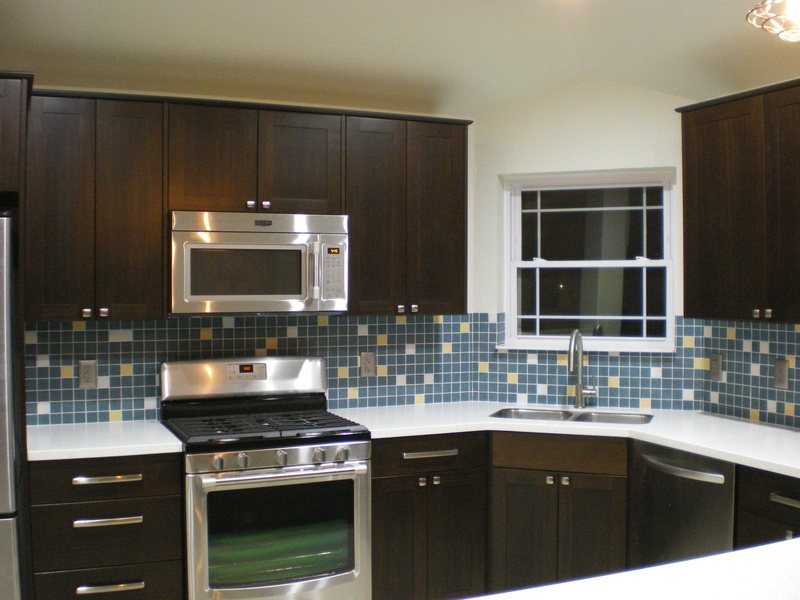 The average Oklahoma City cabinet shop is going to service builders wanting cheap cabinets that can be cranked out fast and with cheap materials. 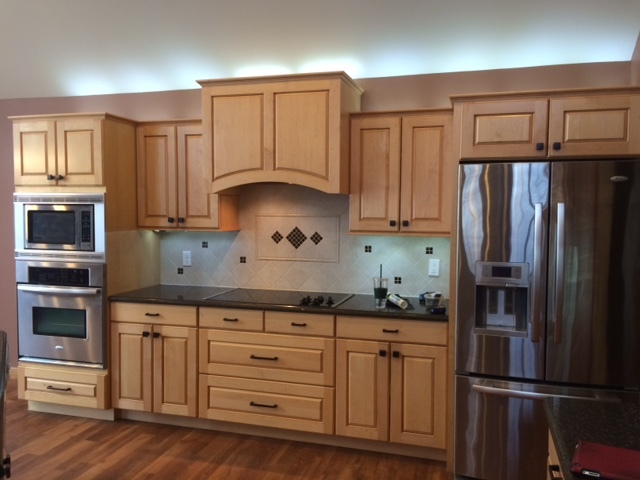 This was a set up in Edmond, soft white maple MDF core construction. 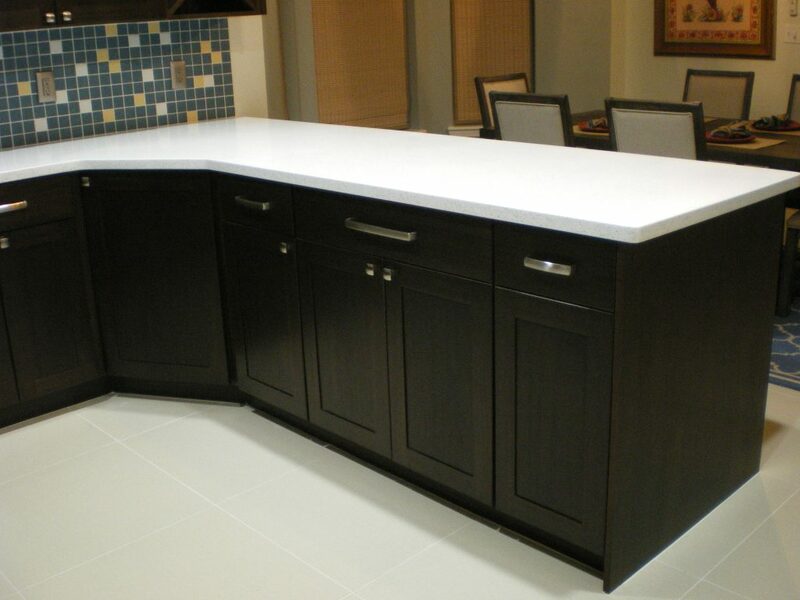 Notice how well the island bar back matches? This is why we like to control the bar back wall even if it does cost a bit more. This is not a job for the typical Oklahoma City cabinet maker much less the typical Oklahoma cabinet shop that employs laborers trained to do one part of the job. All the grain is matched across each section, top to bottom and side to side. If you drop a single part and it gets bruised or chipped you have to re make that entire section of doors and drawers. Each part has to be tracked and marked as to which is the front side and back side, and the orientation so the grain lines up once you hang the doors and drawers. With this sort of look there is zero margin for error, each part must be extremely square and parallel and of exact size. Very unforgiving work. Without the normal shapered edges it takes a lot of time to line up all the adjoining surfaces of the doors, drawers, and end panels. Any one part with a twist in it will necessitate remaking that entire section to keep the grain lined up. There aren’t many of these modern sets made because of the time it takes and the risk that a part might get dropped or scratched. 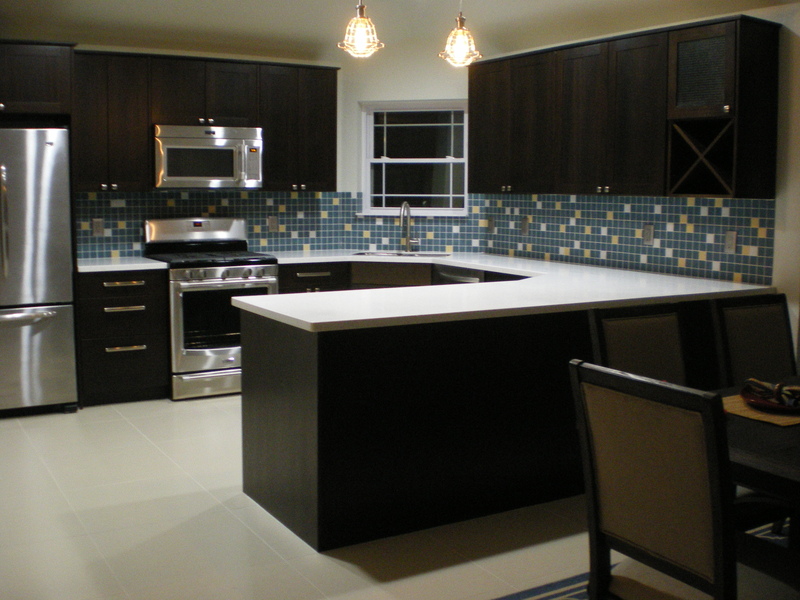 This was another set in Edmond, soft white maple MDF core construction. 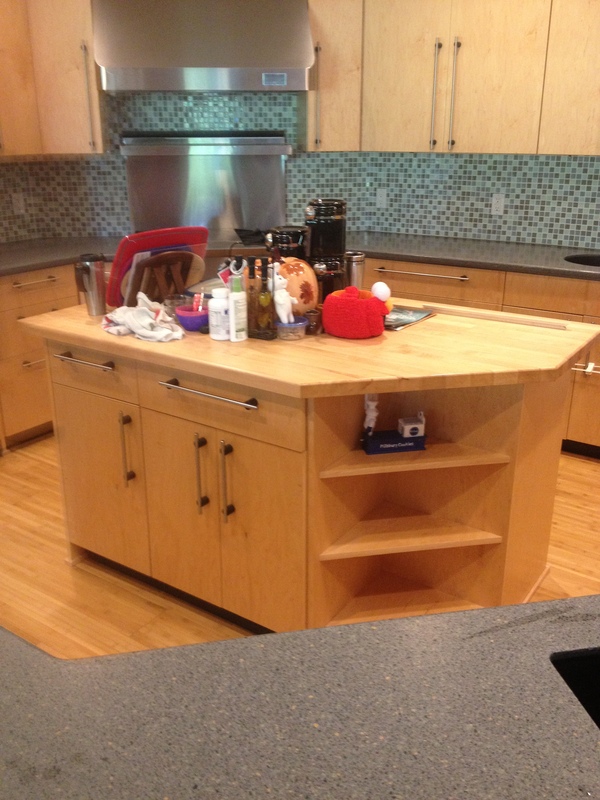 Notice the shape of the island is determined by the shape of the perimeter cabinets. 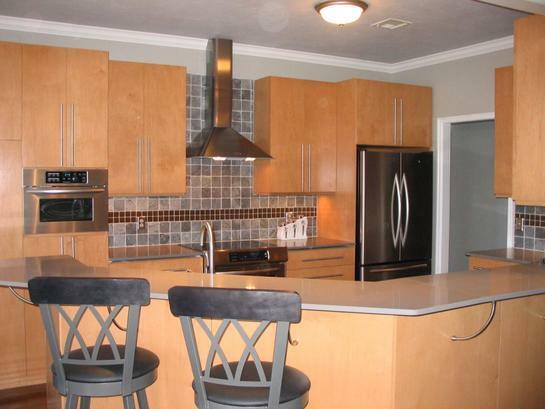 That is a tall broom closet over to the right of the fridge. The front of the bar which you can barely see is covered in tile. The super long pulls, all the pulls, are from Top Knob which we are a distributor for. Takes about a week to order in the knobs and pulls but they are top quality. 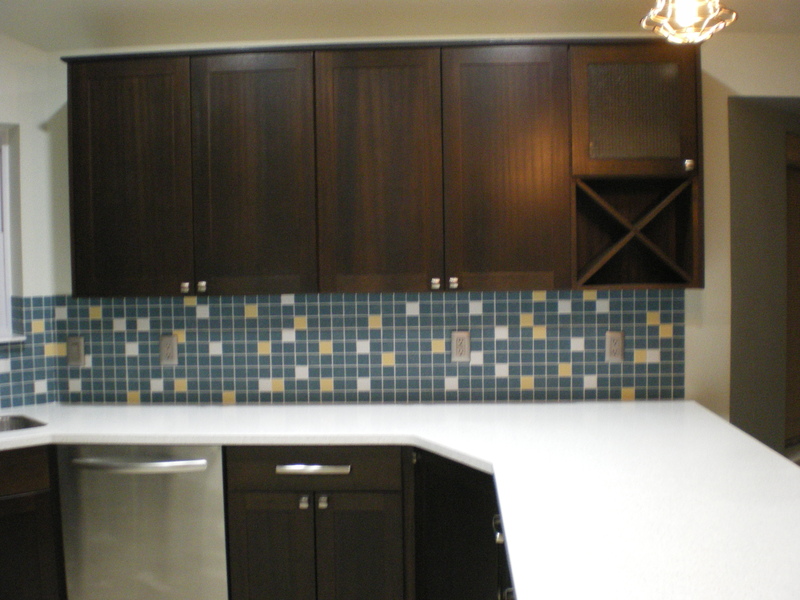 Nice little kitchen desk over on the left side of the sink cabinet set. Really plain, modern looking trim on top. An interesting story behind this set. About seven or eight years after we completed the set we get a call from a panicked homeowner, a 3/8″ water line had snapped under the sink in the middle of the night and no one heard it till most of the house was flooded. The kitchen and all the flooring in that end of the huge home probably soaked in water for six to seven hours. We went out and thanks to MDF construction and the nylon cabinet feet the cost to repair the cabinets was just over $500.00. 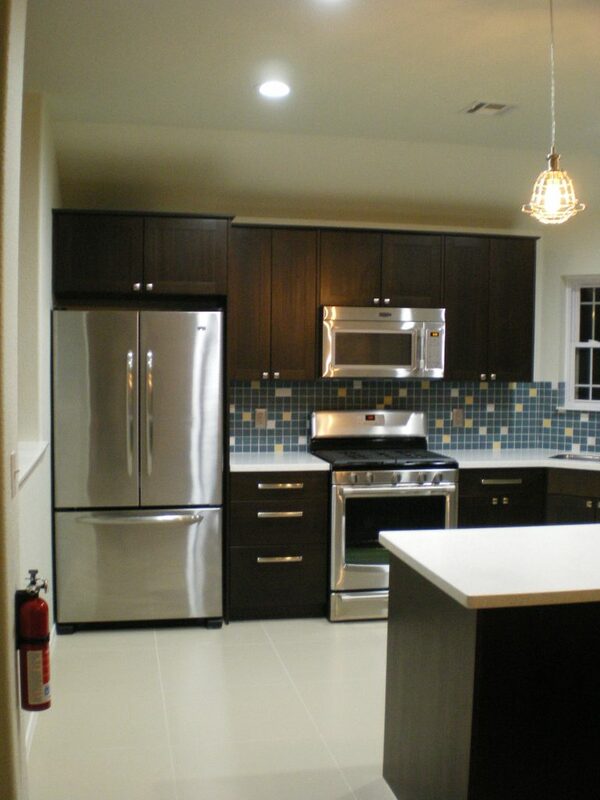 This was a $20,000.00 set of cabinets and countertops and those feet saved it from ruin. They needed new toe kick and even though it was solid maple, probably because it was solid maple, it was ruined but the end panels were just fine. The two doors that covered the prep sink where the water line broke needed replaced, could have sanded them down but it wasn’t worth the risk of having a call back if any water remained in the doors. When we tell people that our guarantee is that if they have a problem then we have a problem this is what we mean. It wasn’t our fault but it was our responsibility to get this fixed if at all possible. Matching bathroom vanities, entertainment centers, linen closets, or walk in closet cabinets can easily be made to fit the available space. We aren’t limited by sizes, looks, or what is in stock in a warehouse or what is coming in from China in a shipping container. 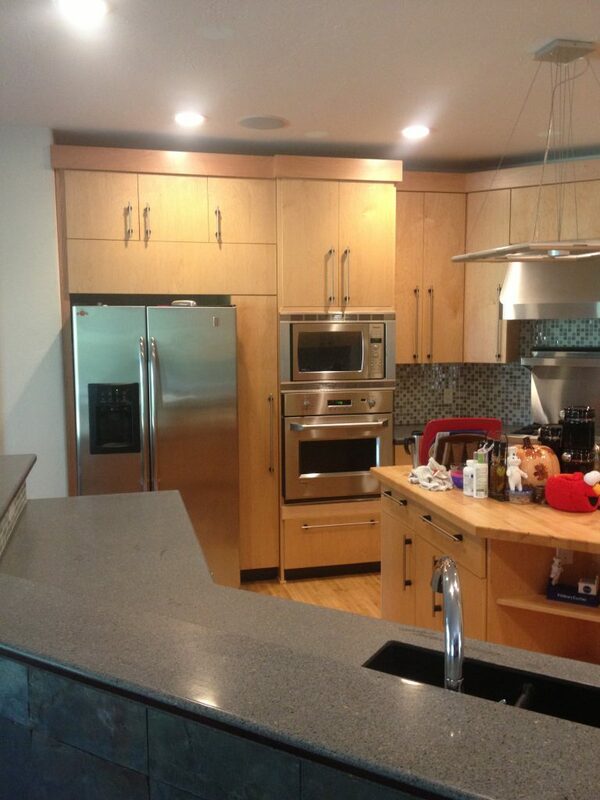 You can have the kitchen of your dreams made by Oklahoma cabinet makers right here in Oklahoma City. 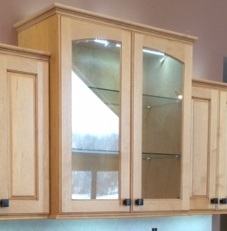 And the beauty of these modern 32 mm built cabinets is that replacement doors and drawer fronts can be made, along with new replacement end panels and crown, changing the entire look of the kitchen for a fraction of the cost of replacing the cabinets. The set could be turned into a rustic Old World look or a traditional set of painted cabinets wth the majority of the work and finishing done in a shop instead of cluttering up a house and filling it with dust and solvent stink.